Everyone I know thinks the red sauce they ate growing up is the best red sauce ever. It's a comforting food, and part of comfort is familiarity and warm memories. Usually, we make more of an SP-style red sauce, but when I suggested spaghetti and meatballs and SP agreed, I insisted on my mom's sauce. Because it's the best, of course! My mom's sauce is tomato puree and tomato paste + onion, green pepper, and celery + brown sugar, Worcestershire, pepper, parsley, oregano. 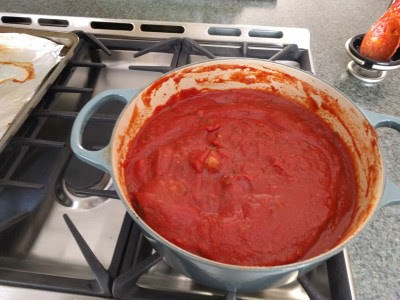 It makes a thicker and smoother sauce than SP's family sauce, which is crushed tomatoes, tomato paste, and water + onion powder & garlic powder + sugar, black pepper, oregano, parsley, parmesan. SP likes the thinner, chunkier sauce. I prefer smooth and thick. We did modify my mom's sauce a bit. Gasp! We added some parmesan rind that was in the refrigerator. I was OK with that because I love cheese. My mom browns ground meat for her sauce but we made meatballs and put them in the sauce. For the meatballs, we used SP's family recipe. After browning them in the oven, we added them to the sauce and simmered it all in the Dutch oven for about 6 hours. The meatballs flattened a bit when they baked in the oven. We made the meatballs and sauce on a snowy Saturday. Instead of spaghetti, we used angel hair pasta, which I prefer. My dad always preferred angel hair pasta and that's what we used for spaghetti dinner when I was a kid. It was years before I realized I wasn't really eating spaghetti. The first time I ordered spaghetti at a restaurant and fat noodles arrived, I was so sad & confused and my mom had to explain it to me. I'm OK with spaghetti, I just prefer angel hair. Even SP admitted that my mom's sauce was pretty darn tasty. I thought it was excellent and I was quite happy. The meatballs were very good, too. I ate 2 for each dinner, SP ate 3. If using ground meat instead of meatballs, brown the meat in a large pot. Remove meat to drain and clean grease from pot. Add olive oil and saute vegetables in olive oil until softened. Add the puree, paste, brown sugar, Worcestershire, parsley, oregano, and pepper. Add browned meat. Stir well. Add a bit of water if sauce is too thick. Simmer for at least 5 hours, stirring occasionally. Use for lasagna stuffed shells, or serve over your favorite pasta. Break up slices of bread and soak in water for 2-3 minutes. Add eggs and mix well. Mix in remaining ingredients. With wet hands, form meat mixture into small balls. Spray a cookie sheet with non-stick spray and bake at 350 until browned on bottom. 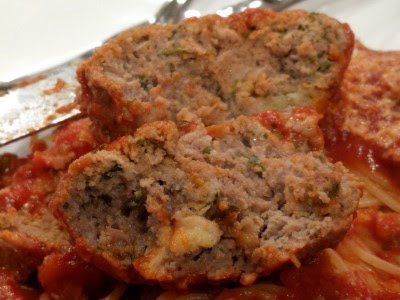 Turn the meatballs over and bake until done (or transfer to red sauce and simmer in sauce until done).